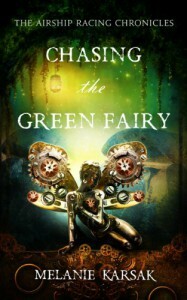 I am honored to have received an advanced copy of Chasing the Green Fairy from the author for an honest review. This review is going to be difficult because I'm afraid I'll give away something crucial. I'm going to tread lightly, and hopefully give you a glimpse into yet another amazing novel in The Airship Racing Chronicles without spoiling the plot. When I saw the cover for this novel, I thought it was breathtaking! I still do! Like Chasing the Star Garden, the first novel in The Airship Racing Chronicles, the cover spoke to me, even before reading a single word. There are hints to Chasing the Green Fairy's story in the cover, and it speaks to the cover designer's talent. Lily Stargazer is thrown into the midst of another adventure! Though this one starts with heartbreak. All I'll say is make sure you have plenty of tissue nearby. And don't read in public where you may have to explain that you're just distraught because of a novel. Yet again, I am amazed at the amount of character background and details Melanie Karsak introduces without slowing the plot. Melanie said this one is more character driven, and oh boy was she right! I love learning how Lily and Byron met (and in true Lily fashion, it involves a broken nose), and seeing their relationship blossom into what it is today. It was interesting to watch Lily grow in this novel. Her relationship with Sal is unique - yet so is her relationship with Byron. I find it fascinating how Lily deals with her relationships with both of these men. Then we meet Robin. Whoa, I did not see that coming! No spoilers here, though. The manor carved out of the side of the mountain is beautiful in my mind, and especially the room with the roots trailing down the wall, in which purple flowers are nestled. I could feel the magic - not only in the building, but in Melanie Karsak's writing. Though this book has sad moments, there are more beautiful and mystical moments. And it is these moments that left me wondering about what I might find in the sunrise. If I truly looked and felt the magic of the moment, would I learn the ancient secrets of the realm? While there is a notation to readers that this novel is for mature readers due to steamy scenes and depictions of drug use, I didn't find either to be offensive. Any fans of steampunk, adventure, or fairy lore would love this novel! Melanie Karsak transforms simple words into beautiful moments and feelings. Get this book - but grab Chasing the Star Garden first - and witness the magic for yourself.